We have started learning skin facts last week, specifically on the skin (surprise) isn’t the largest organ and that well, we don’t really know what’s in our dust. This week, we’re taking up a notch on going ‘intensive’ into the difference in the sun protection function of adult, child and eczema skin. Adult skin has a fully developed sun protection function, in the form of pigment melanin which gives the skin its color. Therefore, the darker one’s complexion, the higher the sun protection. Melanocytes are the melanin-producing skin cells and it is the activity of the melanocytes, i.e. the amount of melanin produced, and not the number of melanocytes that determine the skin color. When one is exposed to sun, more melanin is produced to help protect the skin against UV rays, thus giving a ‘tan’. Melanin can reduce the oxidative damage caused by UV rays but isn’t able to fully protect from the damaging effects of UV rays (see this news on potential harm of ‘sun-activated’ melanin to our skin). An infant’s skin has not fully developed in many ways that make a baby more vulnerable to the damaging effects of UV rays – it has less pigment/ melanin, thinner skin/ stratum corneum and a higher surface area to body ratio. 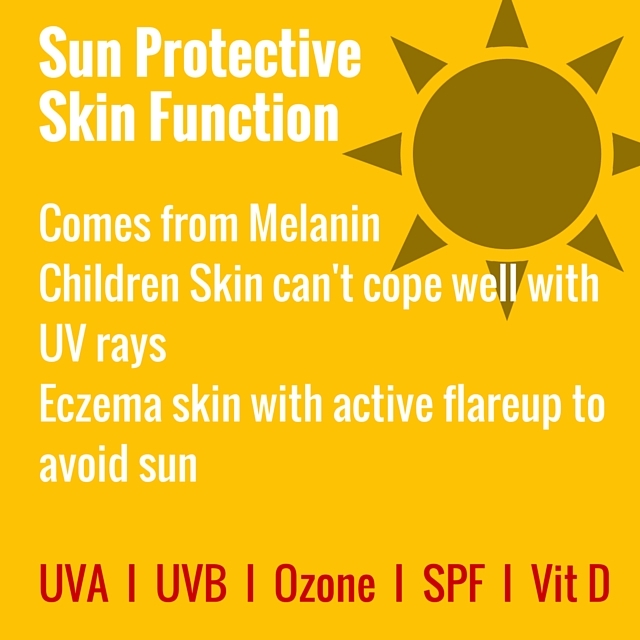 Studies have also pointed to infants with exposure to UV rays will show skin pigmentation on exposed skin from as young as one year old (first summer). This was true even for infants who used sun protection when outdoors but not when in the car, in the shade or on a cloudy day. There are also studies showing that exposure to UV during childhood and adolescence can lead to skin cancer later in life. Some eczema sufferers report improved eczema during holiday when outdoors more often (no study confirmed why holiday seems to improve eczema). Phototherapy is used as an eczema therapy for adults. Active eczema flare-up should stay away from the sun as it can worsen eczema, and increase vulnerability to sun burn. Certain skincare products increase sensitivity to sun, such as those containing ingredients alpha-hydroxy acids (AHAs), beta-hydroxy acids (BHAs), salicyclic acid, glycolic acids, Retin-A and hydrocortisone. Moisturized skin may get sun burn more easily, thus put on moisturizer and wait for 30 minutes before applying sunscreen. Sun – We need it, but not too much of it. Our skin play an important role in the synthesis of vitamin D, where vitamin D can increase the production of skin proteins (cathelicidin) and antimicrobial peptide (AMP) which protects against skin infection. However, just 15 minutes a day is enough and it’s referring to getting sun on the face and arms (i.e. no need to be in a bathing suit!). During summer, 2-3 direct sun exposures of 20 minutes per week is sufficient. Short frequent sun exposure is better than long exposure. UVA – UVA activates melanin already present in the upper skin cells but the tan is lost quickly. Penetrates deeper into the skin, damages the dermis (middle skin layer), accelerates aging, causes wrinkles, increases oxidation and suppresses cutaneous immune function. UVB – UVB stimulates the production of new melanin, and a longer lasting tan. Also stimulates a thicker epidermis. Absorbs by the epidermis (top skin layer). It’s not just the sun, it’s also the ozone. We all know that the ozone layer is thinning and the thinner ozone has allowed more UVB rays to come through the atmosphere. Lips and eyes are also affected by UV rays, thus wearing a wide-brimmed hat and sunglasses are also part of sun protection. It is recommended to use physical blockers/ inorganic filters such as zinc oxide (more UVA protection) and titanium dioxide (more UVB protection). As opposed to chemical absorbers, physical blockers do not penetrate more than two layers of stratum corneum and therefore less likely to induce skin irritation and sensitization. Moreover, infants tend to rub their eyes and may inadvertently rub the sunscreen into their eyes and won’t be able to ‘get rid’ of it as (i) their tear secretions and (ii) their blinking mechanism are not fully developed. SPF is the measure of ratio of UV rays before sunburn and SPF 30 means that the skin is able to take 30 times higher dose of UV rays before sunburn. The amount of sunscreen to apply is 2mg/cm2. Broad spectrum refers to additional UVA absorbers (avobenzone and octocrylene) being added to the physical blockers.